So cute & so good! 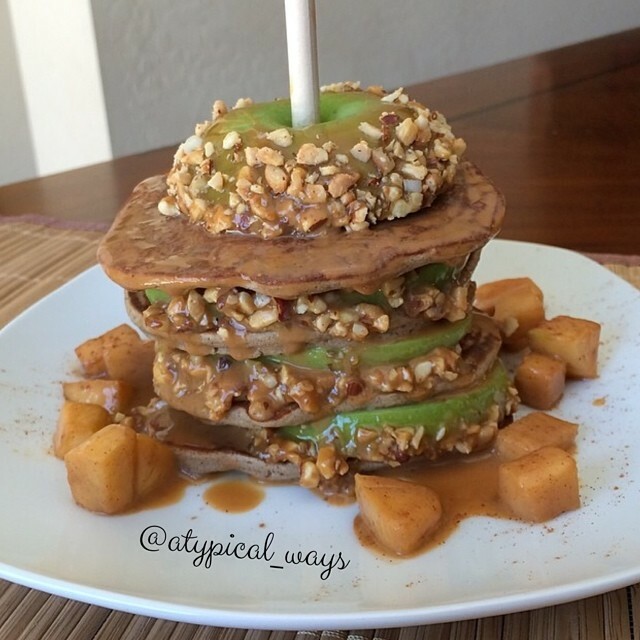 I rolled a green apple in caramel and then nuts, sliced it up & layered it between pancakes. 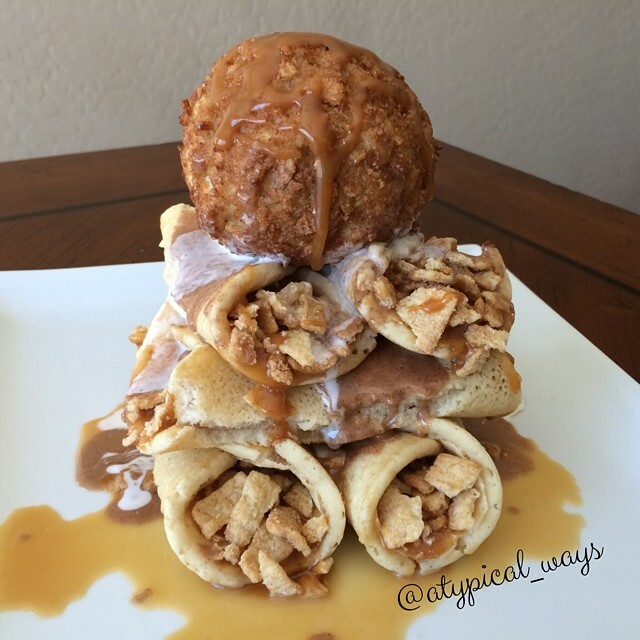 I topped everything with some more apple that had been sautéed in caramel and cinnamon! 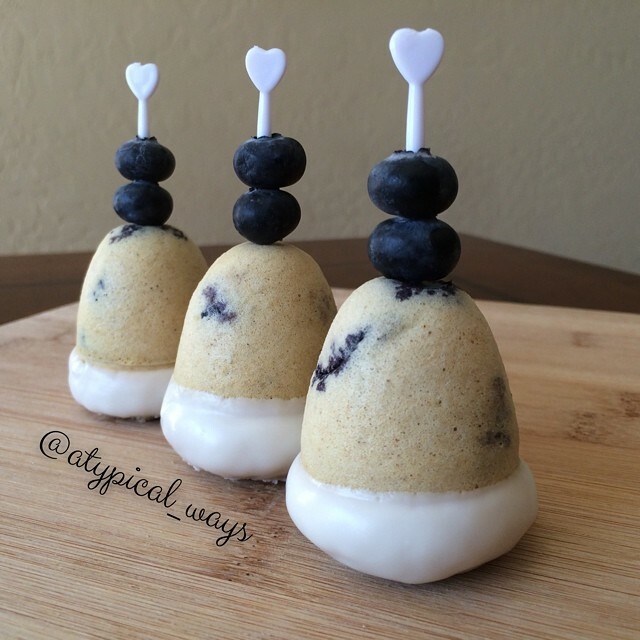 Blueberry Pancake Muffins in a vanilla glaze. So simple to make & ready in 25 minutes! Mix up pancake batter of choice per package instructions. Fold in some whole or cut up blueberries (I quartered mine before mixing them in). Pour into muffin baking tin of choice and bake in the oven for just about 12 minutes. While muffins are in the oven, mix together the frosting ingredients in a small bowl. Once muffins have cooled enough to touch, dip into glaze and serve with some more fresh berries! 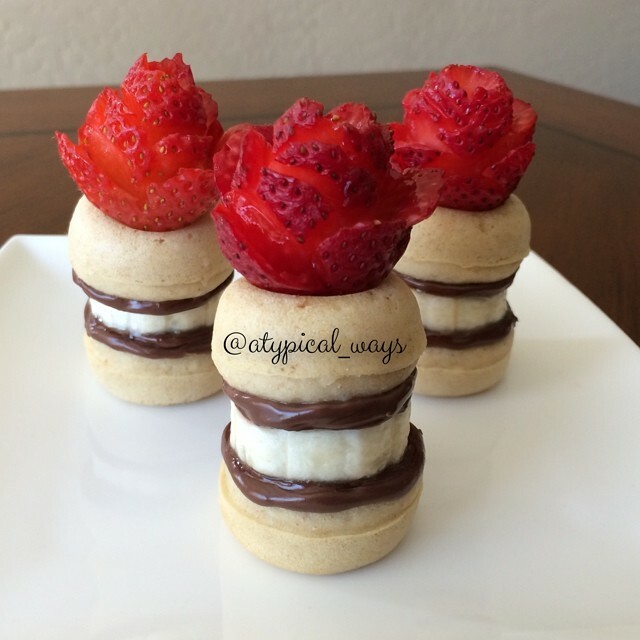 Mini Doughnut Sandwiches with Nutella, Bananas & Strawberries – made in 20 minutes! Preheat oven to 375 degrees. Mix pancake batter of choice per package instructions. Fill a lightly greased mini doughnut pan with 1tbsp of batter in each hole. Bake 8-10 minutes (mine were done at 8 minutes, ovens may vary). While doughnuts are cooking cut up the bananas & strawberries. Once out of the oven layer with sliced banana and nutella & top with a strawberry! Strawberries were made by using many small cuts into the strawberry at different angles and then a spiral cut at the top. 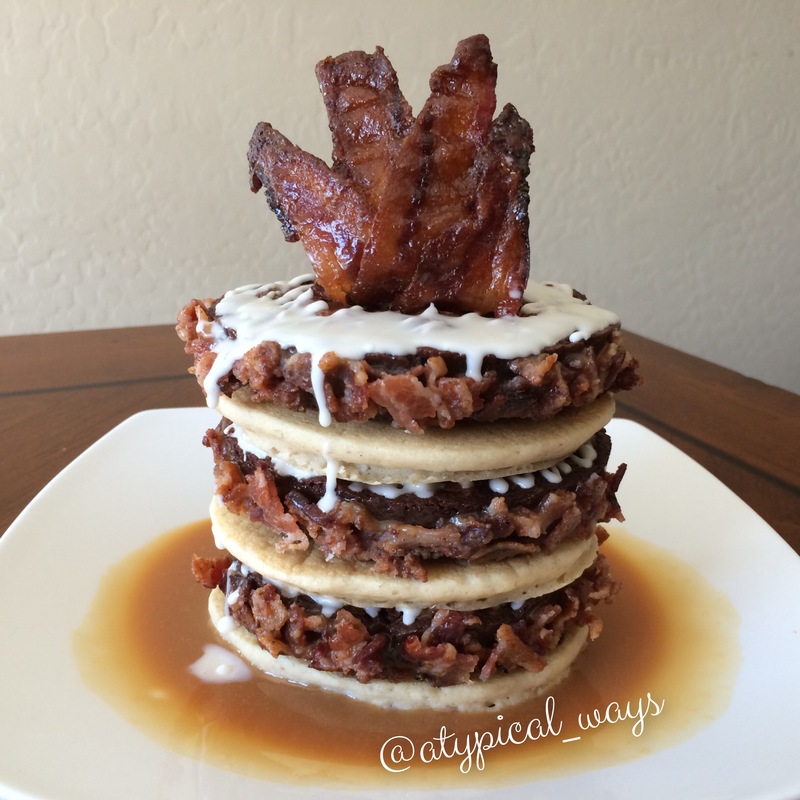 Vanilla protein pancakes layered with Triple Chocolate Brownies that have been rolled into caramel and then into crumbled Maple Candied Bacon! They are finished off with some more caramel and a sweet maple glaze! 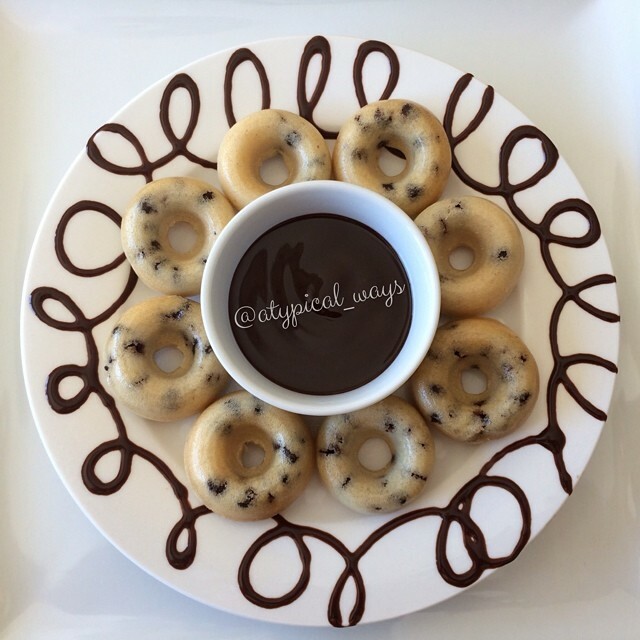 Mini chocolate chip pancake donuts – Easiest thing ever! Takes less than 20 minutes from start to finish with hardly any cleanup! 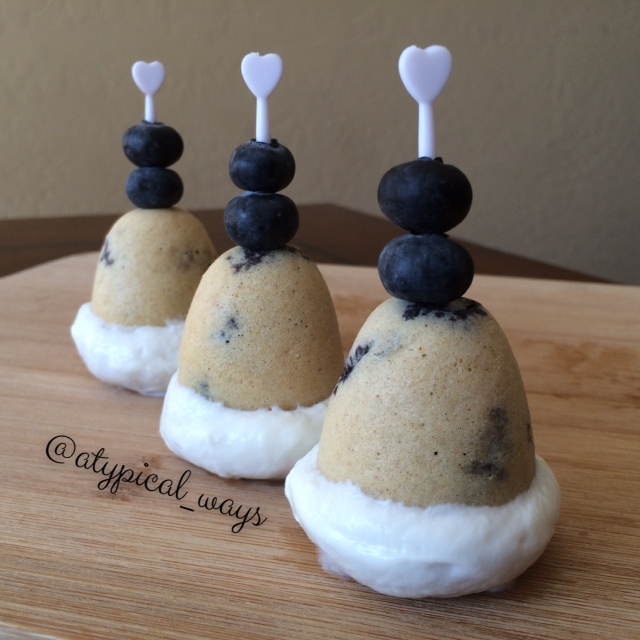 These are the easiest things to make and my son loves them! Preheat oven to 375 degrees. 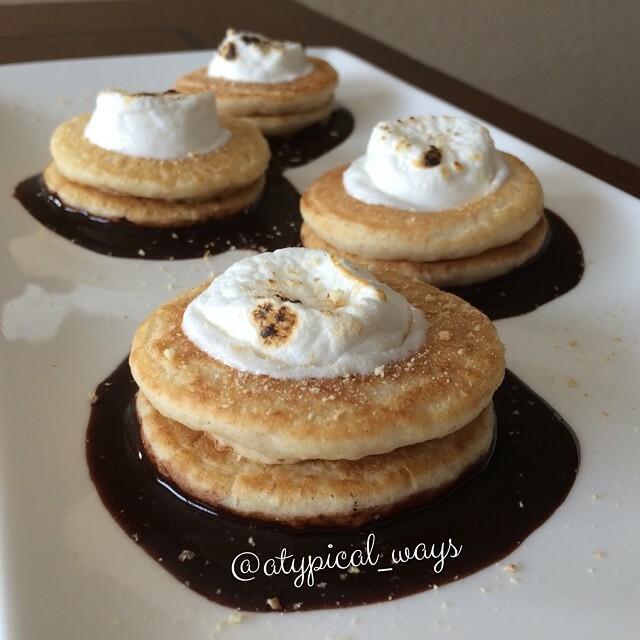 Mix pancake batter according to package instructions and fold in a small handful of mini chocolate chips. Pour into a mini doughnut pan and bake for about 8-10 minutes!